Objective: To study role of HIF-1α in patients with diabetic nephropathy. Methods: This study selected a total of 133 participants including 61 patients with type 2 diabetes but no nephropathy, 49 patients with diabetic nephropathy and 23 healthy individuals as a control at Anhui provincial hospital during January 2012 to December 2016. Nephropathy was identified according to historical estimated glomerular filtration rate (eGFR). Parameters such as Fasting Blood Sugar (FBS), Blood Urea Nitrogen (BUN), Urine Albumin Creatinine Ratio (UACR) were also tested and recorded. Biopsy assessment was conducted when renal function or urinary abnormalities was inconsistent with the clinical expression or the natural history of DN. Western blotting was used to test the expression of serum HIF-1α in all patients and the control. Results: Values of FBS, BUN and UACR were all significantly higher in DN and diabetes groups compared with the healthy control. Meanwhile, values of FBG, BUN and UACR were also all significantly higher in DN patients compared with the diabetes patients with no nephropathy. eGFR in DN patients was significantly lower than other two groups. No obvious lesion was observed in the diabetes patients with no nephropathy. However in DN patients, pathological changes were obvious in tubulointerstitia. In DN patients, expression of HIF-1α was significantly higher than both diabetes patients with no nephropathy and the healthy control, P<0.05. Patients with large amount of albuminuria showed highest expression of HIF-1α compared with other groups. However, HIF-1α in normo-albuminuria and micro-albuminuria groups showed no significant difference. Conclusion: HIF-1α was up-regulated in patients with diabetic nephropathy. This study may give clinical basis to the role of HIF-1α in development of diabetic nephropathy. However, further studies are still needed to make deeper insights to illuminate HIF-1α in DN patients. HIF-1α, Diabetic nephropathy, Clinical expression. Among various complications of diabetes, the Diabetic Nephropathy (DN), which is characterized as features of the increase of Urinary Albumin Excretion (UAE) rate, abnormal plasma creatinine level, abnormal Glomerular Filtration Rate (GFR) or calculated creatinine clearance , is one of the major causes of morbidity and mortality for diabetic patients and also the leading cause of End-Stage Renal Disease (ESRD) in Western countries affecting 20%~40% patients requiring dialysis and or transplantation . In developing countries, the incidence of DN is also increasing rapidly . Studies showed that diabetes with proteinuria is a high risk factor of ESRD for diabetic patients [4,5] and the incipient DN, which is recognized as remission/regression of microalbuminuria, is a common feature for both type 1 and 2 diabetes mellitus . Researches for progression of DN demonstrate that DN is associated with lots of biology progresses such as oxidative stress , inflammation  and hypoxia . However, deeper understanding for mechanisms of DN is still insignificant. It has been proved that hypoxia is an acknowledged pathway to nephropathy, and is related to mechanism for the development of DN . Hypoxia-Inducible Factor-1 (HIF-1) is the key mediator in process of cellular oxygen balance . It allows the adaptive responses to hypoxia by participating in progress of cellular energy metabolism, glucose transport, angiogenesis, and so on. HIF-1 can also regulate particular genes involved in hypoxia, such as erythropoietin, vascular endothelial growth factor A and enzymes associated with glucose metabolism . HIF-1α is one of the two subunits of HIF-1 which has been proved to play a crucial role in process of cellular hypoxia. Regulation of HIF-1 activity is critically dependent on the degradation of the HIF-1α . Recently, several studies showed that HIF-1α is up-regulated in DN animals [13,14]. However, to our best knowledge, HIF-1α in DN patients has not been reported yet. In the present study, we investigated expression of HIF-1α in DN patients and studied relationship of HIF-1α and DN risk factors. This study selected a total of 133 participants including 61 patients with type 2 diabetes but no nephropathy, 49 patients with diabetic nephropathy and 23 healthy individuals as a control at Anhui provincial hospital during January 2012 to December 2016. Diagnosis of type 2 diabetes was according to the WHO diagnostic criteria in 1999 . Nephropathy was identified according to the patients’ historical estimated glomerular filtration rate (eGFR) : diabetic but no nephropathy, historical eGFR>90; diabetic nephropathy, historical eGFR<60; healthy, no diabetes and eGFR>90. Historical eGFR was according to the patients’ medical records and was confirmed again before the study. Among the DN patients, patients were further divided into normo-albuminuria, Urine Albumin Creatinine Ratio (UACR)<30 mg/g; microalbuminuria, UACR within 30-300 mg albumin/g creatinine) and large amount of albuminuria, UACR>300 mg/g . Other parameters such as fasting blood sugar and blood urea nitrogen were also tested and recorded. All patients who were with other kidney or urinary system diseases, severe cardiovascular or hepatic diseases, severe infection, pregnant, surgery, cancer, and patients who had used agents that might affect level of serum HIF-1α such as rapamycin, or had used agents that might affect urinary albumin excretion rate such as ACE inhibitor 1 month before the study were excluded. Detailed clinical inflammation of all patients was listed in Table 1. The study was approved by Ethic committee of Anhui provincial hospital. Informed consents were obtained from all participants involved in this study. Table 1. Basic clinical characteristics of the patients. *P<0.05, compared with the healthy control; #P<0.05, compared with the diabetes group. BMI: Body Mass Index; FBS: Fasting Blood Sugar; BUN: Blood Urea Nitrogen; UACR: Urine Albumin Creatinine Ratio; eGFR: Estimated Glomerular Filtration Rate. To confirm the injury of renal tissues in DN patients, biopsy assessment was conducted when renal function or urinary abnormalities was inconsistent with the clinical expression or the natural history of DN. As shown in Figure 1, no obvious lesion was observed in the diabetes patients with no nephropathy. However in DN patients, pathological changes of degeneration atrophy and fibrosis appeared in tubulointerstitial, indicating apparent renal injury of the DN patients. 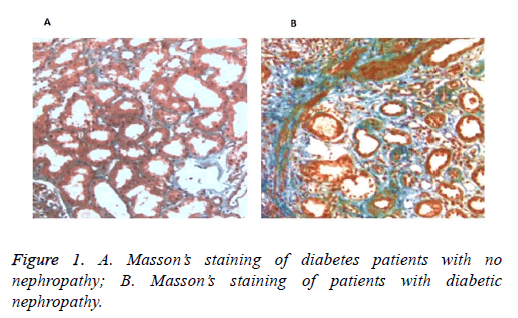 Figure 1: A. Masson’s staining of diabetes patients with no nephropathy; B. Masson’s staining of patients with diabetic nephropathy. To further investigate different expression of HIF-1α in DN patients, DN patients were further divided into normoalbuminuria (n=8), micro-albuminuria (n=12) and large amount of albuminuria (n=29) groups according to UACR. Expression of HIF-1α was determined using Western blotting. Results showed that in DN patients, expression of HIF-1α was significantly higher than both diabetes patients with no nephropathy and the healthy control, P<0.05 (Figure 2). And expression of HIF-1α in large amount of albuminuria group was significantly higher than other groups. However, HIF-1α in normo-albuminuria and micro-albuminuria groups showed no significant difference. Also, diabetes patients with no nephropathy showed no significant difference compared with the healthy control. These results showed that HIF-1α was significantly up-regulated in DN patients, and the abnormal expression might be correlated with nephropathy induced by diabetes. In a word, HIF-1α was up-regulated in patients with diabetic nephropathy. Figure 2: A. 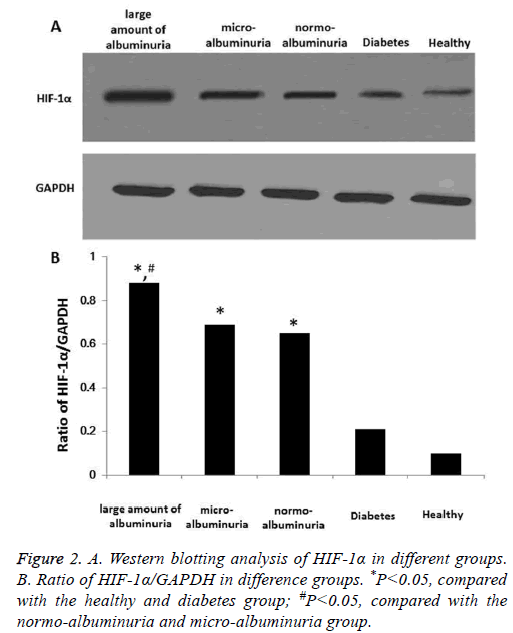 Western blotting analysis of HIF-1α in different groups. B. Ratio of HIF-1α/GAPDH in difference groups. *P<0.05, compared with the healthy and diabetes group; #P<0.05, compared with the normo-albuminuria and micro-albuminuria group. Though studies have demonstrated pathological process of diabetic nephropathy, molecular mechanisms of DN remained unclear. Hypoxia has been proposed to play a central pathogenic role in process of renal diseases. The reducing of oxygen delivery and increasing of oxygen consumption was considered to be the cause of renal hypoxia in diabetes. Recently, role of HIF-1α in process of DN has attracted scholars’ attention. Studies showed that diabetes has a complex repressive effect on HIF-1α and can preclude its optimal reaction to hypoxia [19,20]. Ries et al. showed that HIF-1 could be detected by magnetic resonance imaging (MRI) in the outer medulla of diabetic animals very early . Gu et al. also showed that HIF-1α pro582Ser polymorphism had a protective association with DN in male subjects . However, up to now no studies focused on clinical expression of HIF-1α in DN patients. In the present study, we determined expression of22 HIF-1α in DN patients and found that HIF-1α was significantly up-regulated. The present study involved a total of 53 participants including 21 patients with type 2 diabetes but no nephropathy, 19 patients with diabetic nephropathy and 13 healthy individuals. Comparison was made among different groups to see different expression of HIF-1α. Results showed that HIF-1α was significantly up-regulated in DN patients. Patients with large amount of albuminuria showed highest expression of HIF-1α. Also histological analysis demonstrated renal injury was obvious in DN patients. Some similar studies which used animal models have been reported before. Ortega et al. studied role of HIF-1α in acute renal injury in diabetic mice with experimental endotoxemia, results showed that an increased expression of both HIF-1 and VEGF was reproduced by incubating renal cells . Matoba et al. demonstrated that down-regulating the expression of HIF-1α could prevents the progression of diabetic nephropathy in type 2 diabetic mice . Gao et al. found that by reducing expression of HIF-1α, the levels of pro-inflammatory IL-6 and TNF-α could be decreased in Streptozotocin (STZ) induced rats with diabetic retinopathy . All these results were in consistent with the present study and can illuminate the possible relationship between HIF-1α and DN. In conclusion, we determined that HIF-1α was up-regulated in patients with diabetic nephropathy. This study may give clinical basis to the role of HIF-1α in development of diabetic nephropathy and further studies are needed to make deeper insights. Moresco RN, Sangoi MB, De Carvalho JA, Tatsch E, Bochi GV. Diabetic nephropathy: traditional to proteomic markers. Clin Chim Acta 2013; 421: 17-30. Muthuppalaniappan VM, Sheaff M, Yaqoob MM. Diabetic nephropathy. Medicine 2015; 43: 520-525. Ruta LM MD, Lemesurier R, Taylor HR, Zimmet PZ, Shaw JE. Prevalence of diabetic retinopathy in type2 diabetes in developing and developed countries. Diab Med A J Br Diab Assoc 2013; 30: 387-398. Skupien J, Warram JH, Smiles AM, Niewczas MA, Gohda T, Pezzolesi MG. The early decline in renal function in patients with type 1 diabetes and proteinuria predicts the risk of end-stage renal disease. Kidney Int 2012; 82: 589-597. Halimi JM, Joly D, Combe C, Choukroun G, Dussol B, Fauvel JP. Blood pressure and proteinuria control remains a challenge in patients with type 2 diabetes mellitus and chronic kidney disease: experience from the prospective observational ALICE-Protect study. BMC Nephrol 2016; 17: 135. Hadjadj S, Cariou B, Fumeron F, Gand E, Charpentier G, Roussel R. Death, end-stage renal disease and renal function decline in patients with diabetic nephropathy in French cohorts of type 1 and type 2 diabetes. Diabetologia 2015; 59: 208-216. Mima A. Inflammation and oxidative stress in diabetic nephropathy: new insights on its inhibition as new therapeutic targets. J Diab Res 2013; 2013: 1-8. Lim AK, Tesch GH. Inflammation in diabetic nephropathy. Mediators Inflamm 2012; 2012: 146154. Schiffer TA, Friederich-Persson M. Mitochondrial reactive oxygen species and kidney hypoxia in the development of diabetic nephropathy. Front Physiol 2017; 8: 211. Bento CF, Pereira P. Regulation of hypoxia-inducible factor 1 and the loss of the cellular response to hypoxia in diabetes. Diabetologia 2011; 54: 1946-1956. Singh M, Tulsawani R, Koganti P, Chauhan A, Manickam M, Misra K. Cordyceps sinensis increases hypoxia tolerance by inducing heme oxygenase-1 and metallothionein via Nrf2 activation in human lung epithelial cells. Biomed Res Int 2013; 2013: 569206. Barliya T, Mandel M, Livnat T, Weinberger D, Lavie G. Degradation of HIF-1alpha under hypoxia combined with induction of Hsp90 polyubiquitination in cancer cells by hypericin: a unique cancer therapy. PloS One 2011; 6: 22849. Matoba K, Kawanami D, Okada R, Tsukamoto M, Kinoshita J. Rho-kinase inhibition prevents the progression of diabetic nephropathy by downregulating hypoxia-inducible factor-α. Kidney Int 2013; 84: 545-554. Gao X, Li Y, Wang H, Li C, Ding J. Inhibition of HIF-1α decreases expression of pro-inflammatory IL-6 and TNF-γ in diabetic retinopathy. Acta Ophthalmol 2016. Isohwg W. Definition, diagnosis and classification of diabetes mellitus and its complications: report of world health organisation collaborations. Diabet Med 1999; 15: 539-553. Delia D, Eisele C, Schmid R, Baum P, Wiech F. Urinary exosomal miRNA signature in type ii diabetic nephropathy patients. PLoS One 2016; 11: 0150154. Ma X, Lu C, Lv C, Wu C, Wang Q. The expression of miR-192 and its significance in diabetic nephropathy patients with different urine albumin creatinine ratio. J Diabetes Res 2016; 2016: 6789402. Lu D, Li N, Yao X, Zhou L. Potential inflammatory markers in obstructive sleep apnea-hypopnea syndrome. Bosnian J Bas Med Sci 2017; 17: 47-53. Catrina SBOK, Pereira T, Brismar K, Poellinger L. Hyperglycemia regulates hypoxia-inducible factor-1alpha protein stability and function. Diabetes 2004; 53: 3226. Ries M BF, Tyndal B, Jones R, Deminiere C, Catargi B. Renal diffusion and bold MRI in experimental diabetic nephropathy. J Magn Reson Imag 2003; 17: 104-113. Gu HF, Zheng X, Abu Seman N, Gu T, Botusan IR. Impact of the hypoxia-inducible factor-1α (HIF1A) Pro582Ser polymorphism on diabetes nephropathy. Diab Care 2013; 36: 415-421. Ortega A, Fernandez A, Arenas MI, Lopez-Luna P, Munoz-Moreno C, Arribas I. Outcome of acute renal injury in diabetic mice with experimental endotoxemia: role of hypoxia-inducible factor-1 alpha. J Diabetes Res 2013; 2013: 254529.